Worldwide icon-chevron-right Asia icon-chevron-right Hong Kong icon-chevron-right Shumking Mansion: "Our main objective is to make people dance, groove and boogie to our music"
Shumking Mansion: "Our main objective is to make people dance, groove and boogie to our music"
Despite only existing for the past two years, eclectic psychedelic rock quartet Shumking Mansion have garnered a dedicated legion of fans. 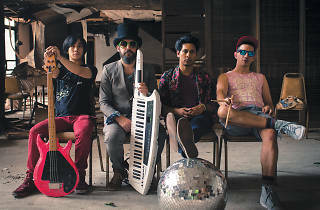 Off the back of their first European tour, the outfit, consisting of Zaid on guitar and vox, Shum on bass, Kent on drums and Jem on the synth and keytar, are set to play the city's hottest new live music venue, Wan CHai's 1563 at the East. Hi Shumking! So how did you guys get started? Shum: We all met each other at different places. Mike (The original drummer) and Zaid met each other at a rooftop party and decided to start a band. Soon after, Zaid went looking for a bassist at Sense 99 and found me thumping away at the bass during a jam session one Saturday night. A jam session was then arranged for the next day, during which we wrote our first song together, Eternally Indifferent. How did you get the name, Shumking Mansion? Zaid: Shum's apartment at the time had a full-sized casino poker table in the living room, courtesy of his flatmates. There would be at least 10 people of various, mostly South Asian, ethnicities seated around the table every night. They would play poker for hours, even days, at a time and the smoke from all the cigarettes and joints would make your eyes water. There were also two coke dealers who frequneted the place. It was exactly like the stereotype people have of Chungking Mansions in TST, so I came up with the idea of calling the band Shumking Mansion. How would you define your act? 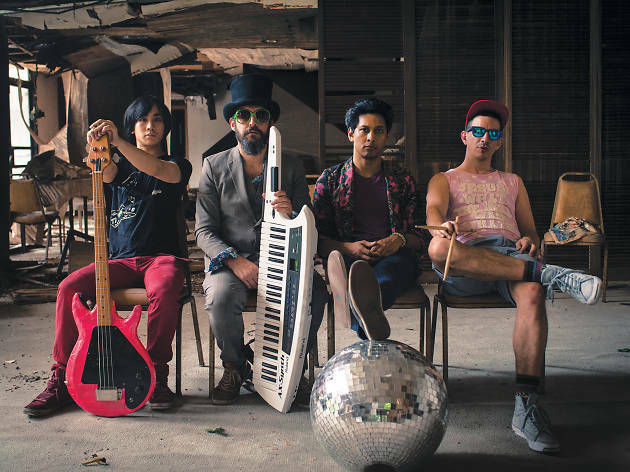 Kent: Our main objective is to make people dance, groove and boogie to our music, so this is what we keep in mind every time we're writing new material. We always request our venues to clear out the tables and chairs to create a dancefloor, so this should give you an idea of what we're like. You recently completed a tour of Europe. What was that like? Jem: Organising a tour in Europe was definitely one of our biggest challenges. We wrote about 150 letters to various venues and we also had to make sure that the sequence of the cities we were visiting would be an efficient, linear affair. The feeling of being on the road, though, is very special indeed, especially when you find yourselves connecting with complete strangers in a country that's completely foreign to you. We had entire venues and bars that were jumping, dancing and grooving to the music we were playing. This is one of the most rewarding experiences any band can ask for. We hear that you have day jobs. How do you balance that with being one of the biggest bands on the scene? Zaid: It takes a lot of commitment. Composition and rehearsals are time and energy-consuming affairs and when you take into account all of the follow-up work we have to do with social media, finding new gigs and venues, you get a huge workload that can only be sustained if it's driven by passion. The European tour, for example, was organised by using our own personal financial resources and taking time off work. Shum: We're aiming to get as much exposure as possible and while we're very good at writing music and performing, we're appallingly horrible at marketing and managing ourselves, so that's something we'll be working on. We might do another tour next year, maybe in North America or maybe in the parts of Europe we haven't visited yet. Oh, and of course, releasing that first album!